Enojoy Sumo match at Ryogoku Kokugikan! The Yakitori sold here is very famous, so you should eat it here! Enojoy Sumo match at Ryogoku Kokugikan! Ryogoku Kokugikan located just north of Ryogoku station in Tokyo is an indoor sporting arena for Sumo wrestling and others. Fifteen day Sumo tournament for deciding grand champion Yokozuna is held here three times a year(January, May and September). It on January is called Hatsu-basho, on May is called Natsu-basho, and on September is called Aki-basho. Sumo is not only one of the popular sports but also the de facto national sport. Especially, the final day of it called Senshuraku is so popular that the ticket of it sells more than twice price(how to buy Sumo ticket). 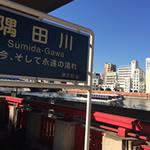 Ryogoku Kokugikan is opened from 8:00 am to about 6:00 pm during the fifteen tournament, but audiences is few until 3:00pm except above Senshuraku and weekend because Yokozuna appear at about 3:50pm and main event start after 4:00pm. The tournamnet of a day ended at about 6:00pm with bow-twirling ceremony, Yumitorishiki. By the way, Sumo ring called Dohyo doesn't fix the floor, and it fall into the undergroud when the other sports event are hold. In addition, there's the factory of Yakitori for sales operated by Kokugikan Servise under the ground too. Yakitori is the Japanese food type of skewered chicken, and chickens are good luck charm for Sumo wrestlers because they stand by their two feet and don't touch the ground by their hands(Sumo wrestlers lose when they touch the ground by their hands on Sumo rule). 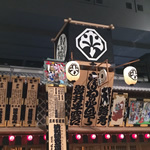 Therefore, Yakitori sold here is very famous, and the mascot of Ryogoku Kokugikan is the chicken. You may have Yakitori if you watch Sumo here. You can access the web page, Sumo Live TV, by your mobile phone or PC on WiFi here. 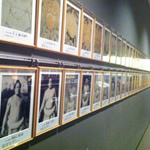 It destributes video of explanation about Sumo, works of Gyoji and more. Pay attention you can't access other web site on its wifi, and you can't access depends on the place. In addition, you can listen the explanation of each Sumo matches in English from if you have a radio chosen FM 83.4 MHz. Information Center lend spectators the radios for 100yen(1 dollar). Perfect guide of how to buy Sumo tickets! How beautiful Kiyosumi Garden is! 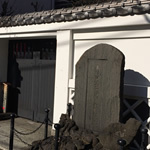 Feel Matsuo Basho in Basho Museum!